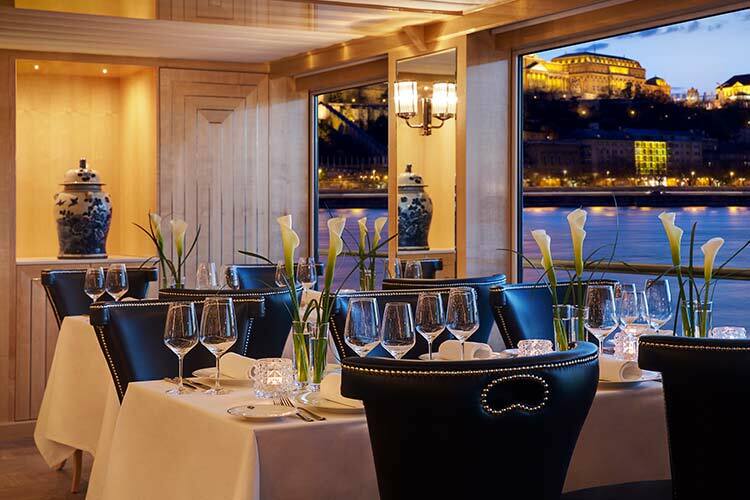 Arrive at Vienna International Airport before being transferred to your Uniworld river cruise ship. The “City of Waltzes” is famous for many things, including world-class art museums, music and architecture (not to mention sinfully rich pastries). See the top sites on a city tour or savor the flavours of the season with our exclusive “Taste of Christmas” guided walking. Whichever option you choose, you’ll also have ample time to explore one of Europe’s greatest Christmas markets. Vienna is a city steeped in history, music and elegant architecture. Mozart, Austria’s most famous citizen, was at the height of his creative powers when he lived here, writing perhaps his best-known works, including The Marriage of Figaro, Don Giovanni and Eine Kleine Nachtmusik. He found Vienna a very inspiring place, and so will you. 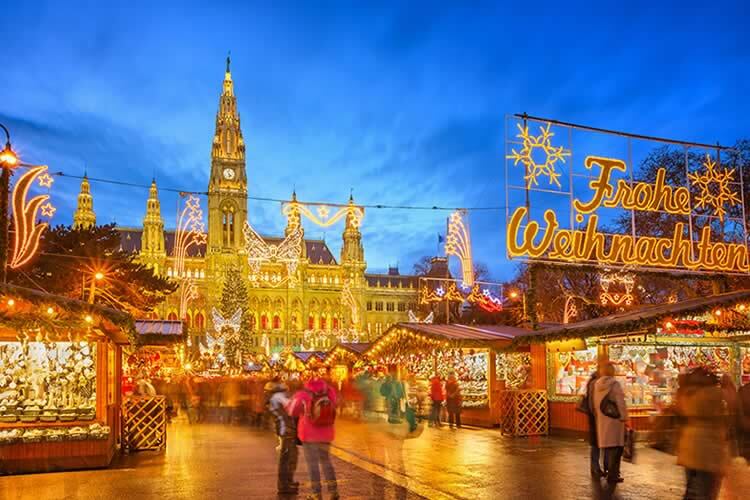 You’ll have a full day to savor the Christmas spirit in Vienna. A special Captain’s Welcome Reception and Dinner will be prepared for you this evening. Featured Excersions: Bavarian Christmas celebration with dinner in a country barn. Choice of Linz walking discovery tour with Christmas Market or Linz town and country: opera house and cider farm visit with Christmas Market. There’s more to Linz than its famous Linzer torte, although that alone makes it well worth a visit. The city has a thriving contemporary art scene, and its two Christmas markets are over-the-top enchanting. See the sights on foot with a local expert, or take a behind-the-scenes tour of the Linz opera house and taste cider at an Austrian apple and pear orchard. Your ship sails along an especially scenic stretch of the Danube called the Schlögener Schlinge, a great loop where the river almost doubles back on itself, before arriving in Linz. In keeping with the Austrian traditions of good food and good music, Linz gave rise to both the Linzer torte and the Linz Symphony. The torte is a delectable confection, and the symphony is one of Mozart’s most celebrated works. The story goes that the composer was so inspired by the beauty of the city that he finished his Symphony No. 36 in less than a week here in 1783. This vibrant city, the second largest in Austria, has been a center of trade and industry for centuries—and it still inspires artists today. Featured Excersions: Passau walking discovery tour with Christmas Market. Exclusive Bavarian Forest village with Theresienthal glass manufactory visit. Onward to Passau, a lovely place to take a stroll and visit the local Christmas market. Is that the sound of…jingle bells? Yes indeed, but that’s not Santa’s sleigh you’re hearing, it’s a horse-drawn wagon whisking you through the densely wooded Bavarian Forest. This area is known for glass-making, which you’ll observe close-up at a famous workshop. Begin the day in the beautiful Bavarian Forest, known as the green roof of Europe, and then explore historic Passau, the three-river city on the Austrian border. Featured Excersion: “2,000 Years in One Hour” Regensburg walking discovery tour with enchanting Christmas Market in the Thurn and Taxis Castle. Featured Excersion: Nuremberg city tour with Christmas Market. For a truly over-the-top holiday extravaganza, look no further than Nuremberg, which boasts the largest and grandest Christmas Market in all of Germany—and that’s really saying something. The “Gingerbread Capital of the World” pulls out all the stops during the holidays, as you’ll see for yourself on a panoramic tour guaranteed to put you in a festive mood. You could not ask for a more perfect place to begin an exploration of Christmas traditions than Nuremberg. The people of Nuremberg hold their Christkindlesmarkt very close to their hearts. The iconic Christkind, with her white-and-gold dress, long blond curls and golden crown, has been the symbol for the Christmas Market for many decades. During Advent, she is the most important representative of the city; every year she opens the Christmas Market by declaring: “Welcome, young and old, to my little community of wood and cloth. While this market’s splendor is fleeting, the joy it brings is eternal.” And with that declaration, the market festivities begin in a town that is famous for its gingerbread and its long toy-making tradition. A special Captain’s Farewell Reception and Dinner will be prepared for you this evening. 7 breakfasts, 6 lunches, 7 dinners. All meals on board, prepared using the finest and freshest ingredients.